While we all know the Game of Thrones characters very well at this point, they're just that — characters. The real people are a little bit more mysterious. But the information is out there for all of your educational needs. By which I mean so you can find out which cast member to stop planning your wedding to, because they're already happily married with a partner and a litter of children. It's really a public service, what I'm doing here, giving you someone actually feasible to daydream about dating. So, while you're free to fantasize about whoever you like, here are the legitimate dating histories of some of your favorite Game of Thrones cast members. You know, for education. Headey had a nine year relationship with actor Jason Flemyng from 1994 to 2003, and married musician Peter Loughran in 2007. Headey and Loughran's son Wylie was born in March 2010, and his parents separated in 2011, divorcing in 2012. In July 2015, Headey gave birth to her second child, a daughter named Teddy, in July 2015. As of a July 2017 New York Times profile, she revealed that she is engaged to her childhood friend Dan Cadan, with whom she had Teddy and whom she started dating "a few years ago" after her divorce from Loughran. Oh, Daario Naharis, you beautiful man. You beautiful taken man, unfortunately for me and all the rest of you oglers. Huisman has been married to a Dutch actress named Tara Elders since 2008, and the two have a daughter named Hazel Judith. Natalie Dormer's character Margaery Tyrell had her share of engagements before finally making it down the aisle, but Dormer has had only one, and has yet to make it official. The lucky man is Anthony Byrne, whom Dormer has been dating since 2007, and engaged to since 2011. With all the women who have made their way through Tyrion Lannister's bed, it might surprise you to find out that Dinklage is quite the monogamist. He married theater director Erica Schmidt in 2005, and the two have a daughter together — Zelig, born in 2011. Sadly for all of you, the King in the North Robb Stark might be off the market — and not just because of the Red Wedding. After dating fellow actor Jenna Coleman, from Doctor Who, since at least early 2012 (although they did break up briefly in June 2015 because of their busy schedules, only to get back together a few months later and then split again in 2016), he's seen been rumored to be dating actress Ellie Bamber after the two were spotted kissing in Ibiza in August 2017. Word on the street is that the Mother of Dragons is single, having dated Seth MacFarlane from 2012 to 2013, with unconfirmed rumors flying that she also hooked up with her co-workers Kit Harington and Richard Madden — before both men's current relationships, of course. 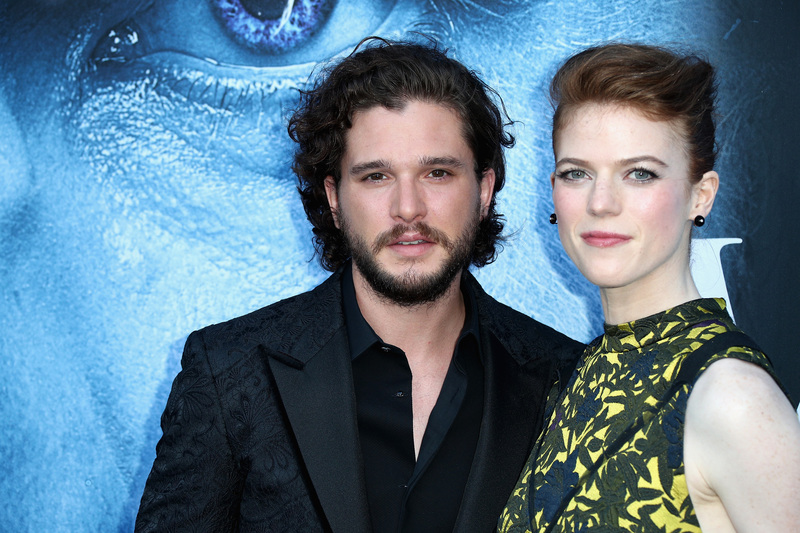 Kit Harrington is another who has previously been rumored to have dated a couple of his co-stars — Rose Leslie, who played Ygritte, and Emilia Clarke, who, of course, Daenerys Targaryen. However, it's only the first relationship that has been confirmed: Harington discussed moving in with Leslie, his girlfriend, in an Esquire profile in May 2017. I hope you didn't have your heart set on being part of Littlefinger's newest scheme, because his romantic life is a little complicated IRL. Gillen has been married to Olivia O'Flanagan since 2001, and the pair has two children — Berry and Joe Murphy — but have been separated since 2015. Gillen is now supposedly dating Camille O'Sullivan, a musician. Part of Brienne of Tarth's whole deal in Game of Thrones is that she's unlucky in love, but that trait certainly doesn't correspond to the real world, where Christie has been happily dating fashion designer Giles Deacon since 2013. Considering the reputation for disloyalty he has onscreen as Jaime Lannister, I was surprised to find that Nikolaj Coster-Waldau is in the longest relationship of anyone on this list. He's been married to Greenlandic actress and singer Sascha Nukâka Motzfeldt since 1998, and they have two daughters — Filippa, born in 2000, and Safina, born in 2003. If you're feeling betrayed by anyone you thought mutually understood you'd fallen in love with them through the television screen, I know exactly what you mean. But, hey, if you're a True Fan, then you're happy that your idols are happy. Right?